Plastic Tap Covers for CMC Parallel & Tee Tap Connectors | Cal Fasteners, Inc. Type TC plastic tap covers are made by CMC and specially designed to fit their type GPT aluminum parallel connectors and tee tap connectors. Manufactured from durable, high strength plastic, these tap covers are available in a range of sizes. UL and CSA rated, and RoHS compliant. All CMC products are manufactured in North America. 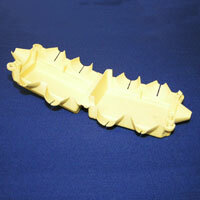 Request a quote on plastic tap covers from CMC, or contact Cal Fasteners to learn more.